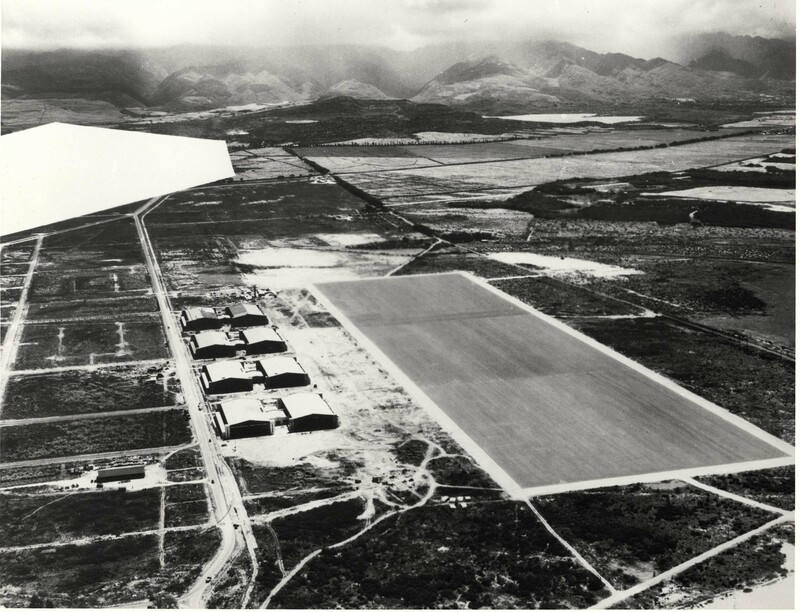 In 1934, the Army Air Corps saw the need for another airfield in Hawaii and assigned the Quartermaster Corps the job of constructing a modern airdrome from tangled brush and sugar cane fields adjacent to Pearl Harbor on the island of Oahu. 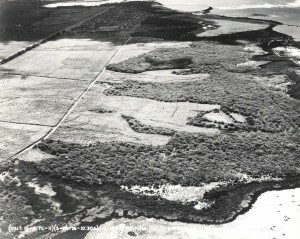 The site selected consisted of 2,200 acres of ancient coral reef, covered by a thin layer of soil, located between Oahu’s Waianae and Koolau mountain ranges, with the Pearl Harbor channel and naval reservation marking its western and northern boundaries, John Rodgers Airport to the east, and Fort Kamehameha on the south. Originally known as Tracks A&B this property was acquired on April 3, 1935 at a cost of $1,095,54.78 from the Bishop, Damon & Queen Emma Estates. The area was 2,225.46 acres. 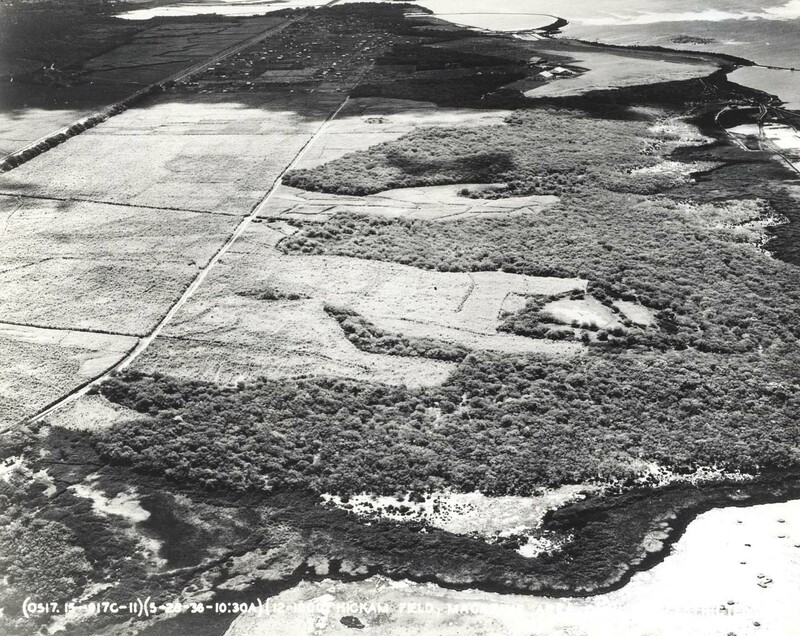 The photo above is an aerial view of Hickam Field before construction, May 28, 1936. The new airfield was dedicated on May 31, 1935 and named in honor of Lt. Col. Horace Meek Hickam, a distinguished aviation pioneer who was killed in an aircraft accident on Nov. 5, 1934, at Fort Crockett in Galveston, Texas. While construction was still in progress, the first contingent of twelve men and four aircraft under the command of 1st Lt. Robert Warren moved from Luke Field on Ford Island to Hickam on Sept. 1, 1937. Hickam Field, as it was then known, was completed and officially activated on Sept. 15, 1938. 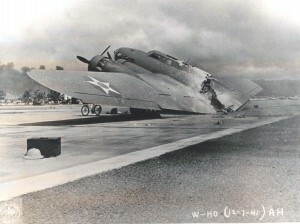 It was the principal army airfield in Hawaii and the only one large enough to accommodate the B-17 bomber. In connection with defense plans for the Pacific, aircraft were brought to Hawaii throughout 1941 to prepare for potential hostilities. The first mass flight of bombers (21 B-17Ds) from Hamilton Field, California, arrived at Hickam on May 14, 1941. By December 1941, the Hawaiian Air Force had been an integrated command for slightly more than one year and consisted of 754 officers and 6,706 enlisted men, with 233 aircraft assigned at its three primary bases (Hickam, Wheeler, and Bellows). When the Japanese attacked Oahu’s military installations on Dec. 7, 1941, Hickam suffered extensive property damage, aircraft losses, and personnel casualties totaling 139 killed and 303 wounded. The bombing and strafing of Hickam Field was an important objective, because the success of the Japanese attack on the Pacific Fleet at Pearl Harbor was dependent on eliminating air opposition and precluding U.S. planes from following their aircraft back to their carriers and bombing the task force. During the war years, the base played a major role in pilot training and aircraft assembly work, in addition to seeing as a supply center for both air and ground troops. Hickam served as the hub of the Pacific aerial network, supporting transient aircraft ferrying troops and supplies to, and evacuating wounded from, the forward areas, not only during World War II but also during the Korean conflict and the Vietnam War. After World War II, the Air Force in Hawaii was primarily comprised of the Air Transport Command and its successor, the Military Air Transport Service, until I July 1957 when Headquarters Far East Air Forces completed its move from Japan to Hawaii and was redesignated the Pacific Air Forces. The 15th Airlift Wing, host unit at Hickam AFB, supported the Apollo astronauts in the 1960s and 1970s; Operation Homecoming (return of prisoners of war from Vietnam) in 1973; Operation Babylift/New Life (movement of nearly 94,000 orphans, refugees, and evacuees from Southeast Asia) in 1975; and NASA’s space shuttle flights during the 1980s, continuing into the 1990s. Throughout those times, and continuing today, Hickam has served as “America’s Bridge Across the Pacific. In October 1980, the Secretary of the Interior designated Hickam AFB as a National Historic Landmark, recognizing it as one of the nation’s most significant historic resources associated with World War II in the Pacific. A bronze plaque reflecting Hickam’s “national significance in commemorating the history of the United States of America” took its place among other memorials surrounding the base flagpole. Dominating the area is a large bronze tablet engraved with the names of those who died as a result of the 7 December 1941 attack. Other reminders of the attack can be seen at Hickam today, including the tattered American flag that flew over the base that morning. It is encased and on display in the lobby of the Pacific Air Forces Headquarters building, where bullet-scarred walls have been carefully preserved as a constant reminder to never again be caught unprepared. Hickam AFB now consists of 2,850 acres of land and facilities valued at more than $444 million. Sharing its runways with adjacent Honolulu International Airport (HNL), Hickam and the HNL constitute a single airport complex operated under a joint-use agreement. Air Force History Written by Lyle Nelson of the Honolulu Star Bulletin for the University of Hawaii Press for the Encyclopedia of Hawaii. It was never published. The Flight of the Betty Jo Hickam AFB Press Release dated August 16, 1972. The P-82 Betty Jo took off from Hickam Field on February 27, 1947 and flew some 5,000 miles to LaGuardia in New York non-stop and with no air-to-air refueling, in 14 hours, 33 minutes. Lt. Col. Horace Meek Hickam Hickam Field/Air Force Base was named for Lt. Col. Horace M. Hickam.